In the course of time, the king of the Ammonites died, and his son Hanun succeeded him as king. David thought, “I will show kindness to Hanun son of Nahash, just as his father showed kindness to me.” So David sent a delegation to express his sympathy to Hanun concerning his father. When David’s men came to the land of the Ammonites, the Ammonite commanders said to Hanun their lord, “Do you think David is honoring your father by sending envoys to you to express sympathy? Hasn’t David sent them to you only to explore the city and spy it out and overthrow it?” So Hanun seized David’s envoys, shaved off half of each man’s beard, cut off their garments at the buttocks, and sent them away. This past week I was witness to an unexpected public confrontation. An intoxicated friend publicly confronted another friend regarding a particular past incident. The former blind-sided and blamed the latter for something after it had been poorly communicated via a third party and created projected misunderstanding of intent and consequence. It was messy and awkward and completely unnecessary. Almost every conflict I’ve ever encountered can be traced back to miscommunication and/or misunderstanding of intentions. So it was for the Ammonites in today’s chapter. 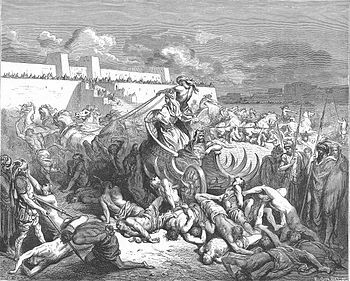 David sent his envoys with the purest of intentions, but his intentions were misunderstood and the resulting escalation and conflict claimed the lives of over 40,000 soldiers. Today I’m mindful of communication and the importance of both speaking and hearing with clarity and discernment. Miscommunication of both words and intent can carry a high price in collateral damage relationally, spiritually, and sometimes even physically. When it comes to those types of price tags, I prefer to be a cheapskate.